Starting last night around dinner time, I knew I shouldn't eat and it was downhill from there. A bug has been going through this town and it hit me like a ton of bricks. Aside from dragging myself out to do the chores, I have been out of commission. This morning the ground was frozen and it was great not to have so much mud....Winnie spent the whole day with the herd. I spent most of the day either in bed or on the couch. Fortunately, Gary brought me some popsicles. Hopefully, tomorrow will be a better day. A gift from Jenny and her family. One of our friends, Alvin A., (in his eighties) continues to do a lot of woodworking and we get all of his shavings. Today Gary picked up 3 barrels so I went out to the barn to fluff up the stalls. The battery for my camera was finally recharged and I was able to do my photographic thing. In less than two hours, the light changed dramatically. I turned Winnie out with all of the horses while I picked 3 pastures and could keep an eye on her. Justine had a conversation with Berlin out in the pasture. Grey....I miss all those sunny days. WILL WE EVER GET TO BE WITH WINNIE? 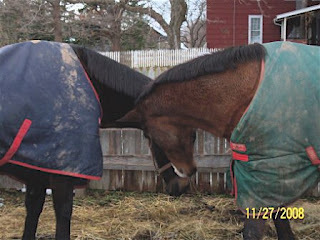 Masterpiece is unhappy when he is not close to Winnie. Winnie started out the morning with Pony and they got along very well... when her owners got here we put Joe in with the two of them. That did not work...Joe wanted Pony (his girlfriend) all to himself and kept herding her away from Winnie. Then we opened all the gates and three of us supervised.... That lasted for a short time and we separated Winnie from the rest so we could all get some work done. It usually takes a couple of weeks for me to get a new horse worked in. It was very muddy today and Joe went down, to roll or what? He couldn't get back up for almost half an hour...for a short time I thought he wasn't going to make it as he was closing his eyes and breathing hard. His blanket did not help. We finally got it off him and used a couple of thick ropes to try and help him in the rear end. The Vet suggested we roll him over, but we did not have to. When he was standing he acted normal and later trotted and cantered. I was in awe!!!! He's 31!!!! For many years our daughter Stephanie and the kids were here for Thanksgiving...now that they moved to Nevada it's not going to happen. However, Ariana and Daniela will be here for 2 1/2 weeks in January...they want to see some snow and get stinky out in the barn. Today, Jenny and her family along with Nanna Pat (Kevin's mom who is an absolute doll) were here for one great meal. Turkey, stuffing, mashed potatoes, squash, cranberry orange relish, waldorf salad, pear salad and pie and cheesecake for dessert. Such sweet blends. Hope you all had a great dinner too. WAS I TIRED OR WHAT? JUST WHAT EVERY HORSE OWNER NEEDS!!!!!!!!! !